To be on the safe side, just let me emphasize that this greedy solution would not work in general, with an arbitrary set of weights. The distinct powers of two are key here. In this case (or the bipartite case, for that matter), greed won’t work in general. However, by some freak coincidence, all the compatibility numbers happen to be distinct powers of two. Now, what happens? List potential pairs, sorted by decreasing compatibility. Pick the first unused pair from the list. Is anyone in the pair already occupied? If so, discard it; otherwise, use it. Are there any more pairs on the list? If so, go to 2. As you’ll see later, this is rather similar to Kruskal’s algorithm for minimum spanning trees (although that works regardless of the edge weights). It also is a rather prototypical greedy algorithm. Its correctness is another matter. Using distinct powers of two is sort of cheating, because it would make virtually any greedy algorithm work; that is, you’d get an optimal result as long as you could get a valid solution at all. Even though it’s cheating (see Exercise 7-3), it illustrates the central idea here: making the greedy choice is safe. Using the most compatible of the remaining couples will always be at least as good as any other choice. Each unengaged man proposes to his favorite of the women he has not yet asked. Each woman is (provisionally) engaged to her favorite suitor and rejects the rest. This can be viewed as greedy in that we consider only the available favorites (both of the men and women) right now. You might object that it’s only sort of greedy in that we don’t lock in and go straight for marriage; the women are allowed to break their engagement if a more interesting suitor comes along. Even so, once a man has been rejected, he has been rejected for good, which means that we’re guaranteed progress. To show that this is an optimal and correct algorithm, we need to know that everyone gets married and that the marriages are stable. Once a woman is engaged, she stays engaged (although she may replace her fiancé). There is no way we can get stuck with an unmarried pair, because at some point the man would have proposed to the woman, and she would have (provisionally) accepted his proposal. How do we know the marriages are stable? Let’s say Scarlett and Stuart are both married but not to each other. Is it possible they secretly prefer each other to their current spouses? No: if so, Stuart would already have proposed to her. If she accepted that proposal, she must later have found someone she liked better; if she rejected it, she would already have a preferable mate. Although this problem may seem silly and trivial, it is not. For example, it is used for admission to some colleges and to allocate medical students to hospital jobs. There have, in fact, been written entire books (such as those by Donald Knuth and by Dan Gusfield and Robert W. Irwing) devoted to the problem and its variations. There are two important cases of the integer knapsack problem—the bounded and unbounded cases. The bounded case assumes we have a fixed number of objects in each category,4 and the unbounded case lets us use as many as we want. Sadly, greed won’t work in either case. In fact, these are both unsolved problems, in the sense that no polynomial algorithms are known to solve them. There is hope, however. As you’ll see in the next chapter, we can use dynamic programming to solve the problems in pseudopolynomial time, which may be good enough in many important cases. Also, for the unbounded case, it turns out that the greedy approach ain’t half bad! Or, rather, it’s at least half good, meaning that we’ll never get less than half the optimum value. 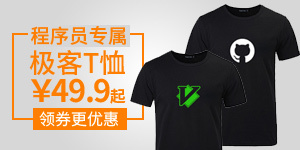 And with a slight modification, you can get as good results for the bounded version, too. 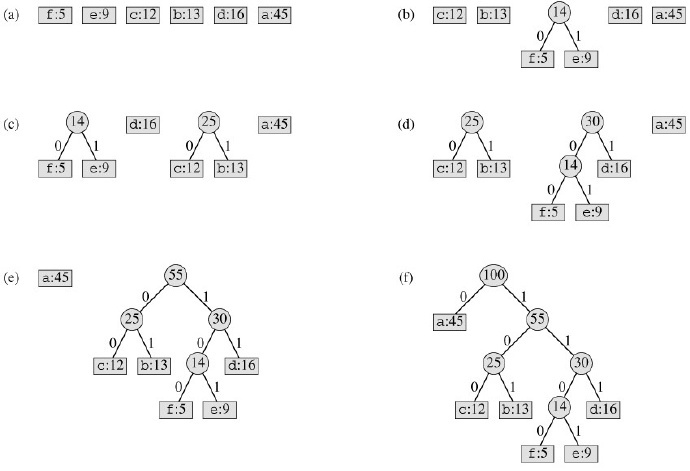 This concept of greedy approximation is discussed in more detail in Chapter 11.
consider how each leaf contributes to the sum over all nodes: the leaf weight occurs as a summand once in each of its ancestor nodes—which means that the sum is exactly the same! That is, sum(weight(node) for node in nodes) is exactly the same as sum(depth(leaf)*weight(leaf) for leaf in leaves). def naive_find(C, u): # Find component rep.
T.add((u, v)) # Different reps? Use it! • We’re using a priority queue, so if a node has been added multiple times, by the time we remove one of its entries, it will be the one with the lowest weight (at that time), which is the one we want. • We make sure we don’t add the same node to our traversal tree more than once. This can be ensured by a constant-time membership check. Therefore, all but one of the queue entries for any given node will be discarded. 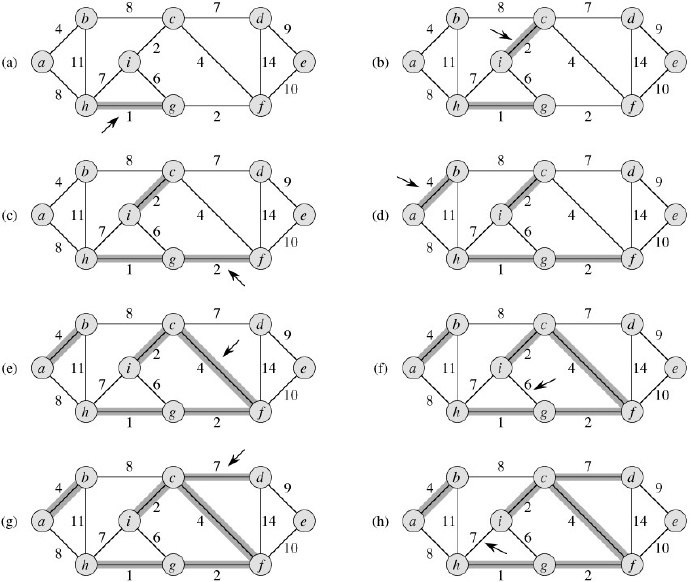 In their historical overview of minimum spanning tree algorithms, Ronald L. Graham and Pavol Hell outline three algorithms that they consider especially important and that have played a central role in the history of the problem. The first two are the algorithms that are commonly attributed to Kruskal and Prim (although the second one was originally formulated by Vojtěch Jarník in 1930), while the third is the one initially described by Borůvka. Graham and Hell succinctly explain the algorithms as follows. A partial solution is a spanning forest, consisting of a set of fragments (components, trees). Initially, each node is a fragment. 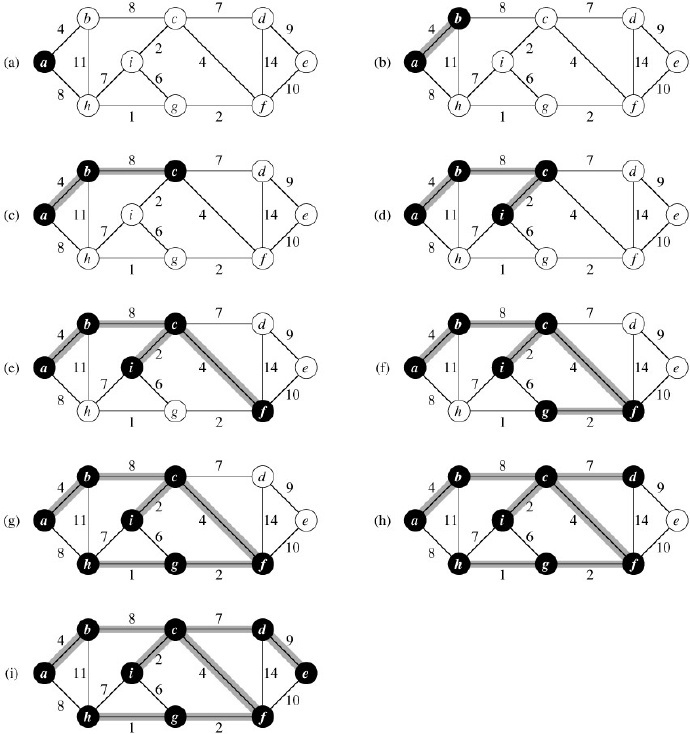 In each iteration, edges are added, joining fragments, until we have a spanning tree. Algorithm 1: Add a shortest edge that joins two different fragments. Algorithm 2: Add a shortest edge that joins the fragment containing the root to another fragment. Algorithm 3: For every fragment, add the shortest edge that joins it to another fragment. For algorithm 2, the root is chosen arbitrarily at the beginning. For algorithm 3, it is assumed that all edge weights are different to ensure that no cycles can occur. As you can see, all three algorithms are based on the same fundamental fact—that the shortest edge over a cut is safe. Also, in order to implement them efficiently, you need to be able to find shortest edges, detect whether two nodes belong to the same fragment, and so forth (as explained for algorithms 1 and 2 in the main text). Still, these brief explanations can be useful as a memory aid or to get the bird’s-eye perspective on what’s going on. This is what Kleinberg and Tardos (in Algorithm Design) call staying ahead. The idea is to show that as you build your solution, one step at a time, the greedy algorithm will always have gotten at least as far as a hypothetical optimal algorithm would have. Once you reach the finish line, you’ve shown that greed is optimal. This is a technique I used in showing the greedy choice property for Huffman’s algorithm. It involves showing that you can transform a hypothetical optimal solution to the greedy one, without reducing the quality. Kleinberg and Tardos call this an exchange argument. This is where we started: to make sure a greedy algorithm is correct, we must make sure each greedy step along the way is safe. One way of doing this is the two-part approach of showing (1) the greedy choice property, that is, that a greedy choice is compatible with optimality, and (2) optimal substructure, that is, that the remaining subproblem is a smaller instance that must also be solved optimally. if TT in S: T = TT # Is it valid? Use it!